Located in the heart of the CBD the hotel's 311 rooms comprise of the latest Samsung television technology and views over the Adelaide Hills. The restaurant and bar spill out onto balconies that overhang Grenfell Street and share the floor with restaurant and conference facilities. The indoor gym comprises of Technogym equipment and WiFi is located throughout the hotel. ibis Adelaide is adjacent to Rundle Mall and the Adelaide Oval, Casino, and Convention Centre are within walking distance. 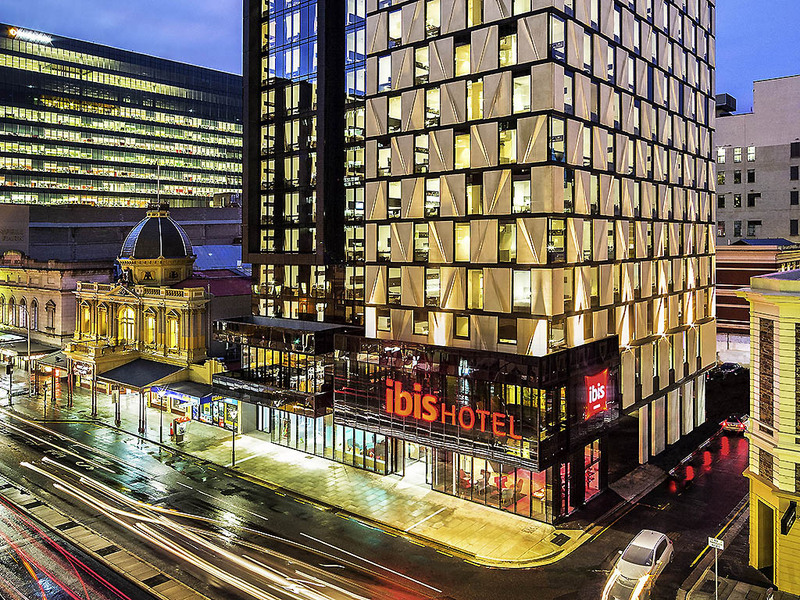 With its central location, ibis Adelaide is located next to Rundle Mall, the city's premier shopping district. The Adelaide Oval, Adelaide Convention Centre, and the casino, as well as the city's best restaurants and attractions are all within easy reach. Available in a range of configurations, the 311 tastefully appointed guest rooms at ibis Adelaide offer the perfect place to relax and unwind. Featuring sleek décor and minimal design, each room maximises the available space to emphasise both comfort and functionality. Palettes are neutral with dark wood accents, highlighting featured artwork by artists such as graffiti artist Ghostpatrol. Guests staying at this Adelaide hotel can also enjoy the superb ibis Sweet Bed and the Samsung Smarthub 690 Series. Located on the first floor, the bar is open daily and is ideal for pre-dinner drinks, meeting friends or to enjoy a nightcap after a long day.